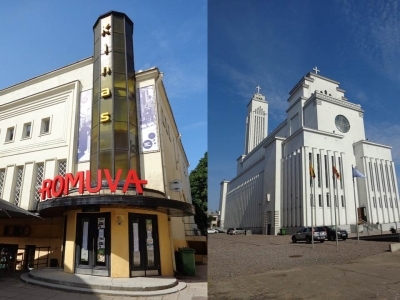 Kaunas 1919-1939: The Capital Inspired by the Modern Movement is part of the Tentative list of Lithuania in order to qualify for inclusion in the World Heritage List. Lithuania gained independence after World War One, however Vilnius was soon after given to Poland. Kaunas was then designated as the new capital of Lithuania. As a consequence, many buildings were built in homogenous modernist style in a short period of time – actually till 1940 when Lithuania was taken by Germany then USSR. It is easy to identify this part of the city on a map of Kaunas, with its straight and large streets, at the East of the historical area. Laisves avenue is the main street of the area. Arriving in the morning from Klaipedia, we stayed one night in Hotel Kaunas (easy to remember that name!) right in the centre of that area, before making our way to Vilnius on the next day, in August 2017. Tourist website of the city provides a good list of most interesting interwar buildings; most of them close to each other. Walking Laisves avenue from East to West, we could see the post office, the former headquarters of Pienos Centras Company (at a street croner), Romuva cinema (on the north side of Laisves avenue, not immediately on the avenue but some 50 m back). Still walking to the East on Laisves avenue and turning next right (South) after seeing the cinema, we immediately found the former Officers’ Palace. One block north of Laisves avenue, you can easily reach Unity Square, surrounded by many “interwar” buildings: former ministries, schools, and the War museum. We wanted to end our tour at Christ Resurrection church (a massive white building on top of a hill), unfortunately the cable car (also listed as interwar building) was closed for maintenance, so we had to climb stairs under warm August sun to reach the church. The visit was rewarding, as the church looks like no other we visited before: it looks more like a factory – and was actually used as such during the period Lithuania was occupied. We enjoyed this half-a-day visit of Kaunas. Interwar buildings are quite concentrated, so you don’t have to walk long from one building to the other. Most of them are still in use (post office, museum, church, restaurant at the ground floor of Officers’‘ Palace), so you can go inside and don’t have the feeling to visit a “museum” city. Others are being restored (cinema, cable car). Panels with information have been installed in front of some buildings, giving the feeling that Kaunas city is making big efforts to showcase this part of its history. Interwar buildings of Kaunas are clearly important in the history of the country, but maybe not fundamental in World history. However, considering there are still few modern architecture buildings on the list, and with a strong supporting file, I believe it could make its way to the List.